The Principality of Monaco (French: Principauté de Monaco; Monégasque: Principatu de Múnegu; Italian: Principato di Monaco; Occitan: Principat de Mónegue) is a small country in southwestern Europe. It surrounded on three sides by France, but has a coast on the Mediterranean Sea. As of 2009, the population of Monaco was estimated as being 32,965. The country is a city state, and the capital is hence coterminus with the entire country. 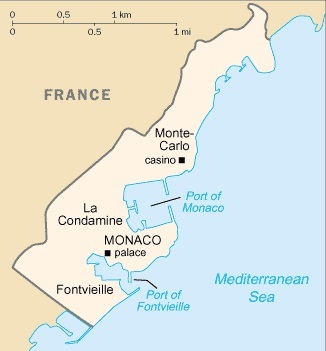 The two most well-known areas within the country are Monaco-Ville, the original fortified town, and Monte Carlo (French: Monte-Carlo; Monégasque: Monte-Carlu; Occitan: Montcarles) which is the most heavily populated administrative area ("quartier") of the city state.